Option 1: To pay by check or credit card, please click on the "Credit Card Donation" button. Option 2: To pay with PayPal, please click on the "donate" button. The Saturday night event at TRAC was sensational. The food was terrific, the music was classic rock and roll, and the camaraderie was in perfect keeping with the spirit of the class of 64. To see a video of interviews from fifteen of our classmates, click on the "70th Birthday Party" link on the top of the left-hand column of this page. Each classmate was refreshingly honest about their memories of Pasco High School and, especially, their lessons learned. To highlight just one of the interviews--all of which were warm and touching--give a listen to Ray Eads, who took a moment to celebrate the wisdom of the women of our class. Very classy, Ray, and right on target. It was so good to see so many friends at this gathering. Although we all have had our share of ups and downs, we all continue to embrace an overall sense of optimism and gratitude. Basically, we are a happy band of brothers and sisters. At this reunion we just seemed genuinely happy to see each other again. A warm word of thanks is merited to the reunion committee who were tireless in making our event a success: Helen Bakshas, Janice Schauss Fraley, Jan Cruzen Francis, Allen Johnson, Kathy Kilbury, Lois Davey Osborn, Helen Rogers Pudwill, and Gary Wallis. And a special thanks to the indefatigable Jan Cruzen who handled the registration and finances, and the effervescent Lois Davey who landed the TRAC location and created the sensational decorations. Our class is blessed to have so many talented and energetic classmates. This last thought: The singer Lyle Lovett once said, "You don't have to have anything in common with people you've known since you were five. With old friends, you've got your whole life in common." It is easy to feel that way with so many PHS classmates, and that reality is a sublime joy. I hope that at our next event we will see some other more timid old friends; we have so much in common. But if, for whatever reasons, they choose not to revisit their old classmates, they will still remain treasured in our hearts. 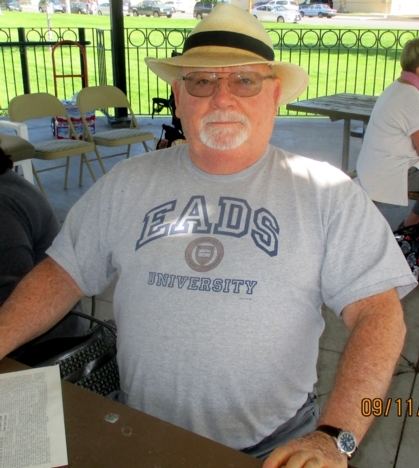 Credits: The photo of Ray Eads was taken by the venerable PHS Photographer, Joe Boyd. The photo booth photo (left to right: Lois Davey, Kathy Kilbury, Jan Cruzen, Allen Johnson, Helen Rogers, Helen Bakshas) was made possible by Platinum Memories.